Why are you afraid to join Stampin’ Up!? What excuses have you voiced? I’ve heard it all and I’ve SAID it all! Maybe you think there is a catch! Or, you’ve said that you don’t want to be a sales person… I couldn’t do this! It’s too good of a deal, there MUST be a catch! Why haven’t you joined the Sunny Craftin’ Crew during Sale-A-Bration? I am sad that the BEST opportunity THIS year is coming to an end. I have never regretted joining Stampin’ Up! as a demonstrator during Sale-A-Bration. My plan was to enjoy the benefits as a hobby demonstrator while my husband and I were on the adoption waitlist. I joined for the discount! Little did I know that I would still be with Stampin’ Up! as a demonstrator 9 years later (although, officially this is my 5th anniversary as I dropped for 4 days then re-signed to be under a different upline after my upline, her upline and the upline above her dropped). Being part of Stampin’ Up! has helped me make it through cancer treatments, meet new people around the world and develop some amazing friendships. I love traveling and meeting up with other demonstrators. Join as a Hobbyist… celebrate the FUN! Why not join my fun, wonderful team! It’s an amazing business opportunity but it’s also great for the hobbyist! TIME is RUNNING OUT! There are only 5 DAY remaining to get this amazing SPECIAL… THIS is NOT a gimmick! There are NO strings attached. Join for the fun and be part of a wonderful, inspiring crafty community! Don’t like it! You can either drop by not meeting the quarterly minimums or you can formally resign. BUT… you get to keep everything without any penalties. BUT… I NEED ONE person to join before the end of Sale-A-Bration on March 31st. YOU would be helping me out as I try to earn the Greek Isle Cruise! 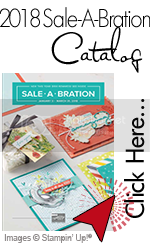 During Sale-a-Bration, you earn 2 free stamp sets from the ANNUAL or OCCASIONS CATALOG (your choice) at any price. That’s a HUGE bonus! A potential value of $101.00 – FREE! You have access to sneak peeks and early product releases. (Shhh… you could see the NEW Annual Catalog in just 2 WEEKS). Now, don’t walk… RUN and join my Stampin’ Up! team today and experience the fun! I would love to introduce you to join Stampin’ Up! and the Sunny Craftin’ Crew! I love the CREW! This is an AMAZING opportunity for you to join or re-join. If you have questions, please email me. I’m happy to set up a call to chat with you about this amazing opportunity. Fill out the Contact Form Below or better yet, JOIN NOW! Again, when you join my team you also help me out! I’m really trying to earn my FIRST incentive trip especially since this is the trip where every person in my family would be celebrating milestone birthdays! Mike and I will be celebrating the BIG 5 – OH (eek!) and Caleb would be celebrating a double-digit birthday as he turns 10 (double EEK)!